"... Rather than winging the fly in the normal fashion... I reversed the wing, Quigley Cripple style...."
E-mail: bruce@wyolaw.com Bruce is an attorney living in Cheyenne, Wyoming. His home waters are the North Platte and its tributaries, but he frequently fishes other Wyoming trout waters, with occasional excursions into neighboring Montana and Idaho. Once a year, usually during the spring, he heads for the saltwater flats. Hans Weilenmann's CDC & Elk has been my top producing dry fly for the past three years. I fish it as a searching pattern, a caddis imitation, and even as a mayfly emerger (with a shortened wing). Recently it produced another good day on a local river, but when I went to the bench to replenish my stock, I was out of the right dry fly hooks. Necessity being the mother of invention, I started to tie the pattern on a light wire scud hook. Rather than winging the fly in the normal fashion, however, I reversed the wing, Quigley Cripple style. Tying the fly in this fashion does two things. First, when wet, the body rides completely under the film, where the movement of the CDC is maximized. Second, it allows a larger clump of deer hair to be used without over-dressing the fly, increasing its already good flotation qualities. The modified pattern has been very successful in recent outings. While I have not fished the original and modified patterns in tandem yet, takes on the "Cripple" Variant are very aggressive. For you other fans of Hans' pattern, you might give this variation a try. I've no intent to abandon Hans' original--it's a winner. It will take much more fishing to reach any conclusions about the modification. If you haven't fished a short winged version sunk, though, give it a rip. With a light wing, even small patterns are quite visible a foot or two beneath the surface. I dead drift it under bankside vegetation with the occasional twitch. Thread: Brown or gray, 6/0. 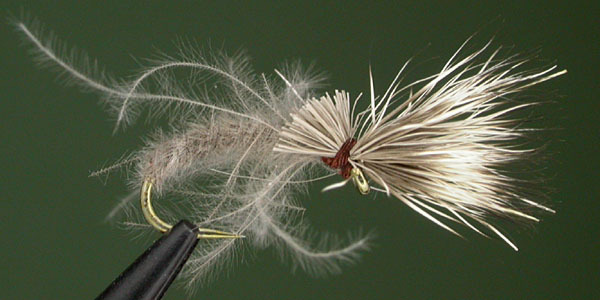 Body: One "Type 1" CDC feather, tip tied at the rear of the shank, twisted and palmered forward. See Hans' instructions for his CDC & Elk., including links to step-by-step instructions and a video clip. 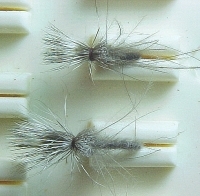 Wing: Deer hair, tied-in reversed, Quigley Cripple style.